Seagate launches Innov8, world's first USB-powered desktop Hard Drive. Seagate Technology today announced the launch of Seagate Innov8, the world's first USB-powered desktop hard drive. Seagate Innov8 features innovation from the inside out with its industry-leading 8TB capacity, trend-setting Ignition Boost Technology and expressive design. With advancements in USB 3.1 technology, major manufacturers like Apple are beginning to rely on one connection-type for everything. Today, with the introduction of Seagate's new Ignition Boost Technology, Innov8 is the world's first 8TB desktop hard drive that does not need to be plugged into a power outlet. Similar to a standard car requiring a battery kick to start the engine, Ignition Boost together with USB 3.1 enables Innov8 to thrive off bus power. No dedicated power source or adapter required. Innov8 also features industry-leading capacity with Seagate's 8TB HDD. Now users simply plug in the reversible USB-C cable and have access to a lifetime of data - including more than two million songs, four million photos and eight hundred HD Movies. Innov8's premium, well-balanced aluminum enclosure and design means users can horizontally or vertically place it on the desktop as they prefer. The industrial design excellence of Innov8-as with Seagate Seven-was done in partnership with Huge-Design, a firm recognized by some of the industry's most influential consumer electronics brands GoPro, HP, and Nike. Innov8 includes Seagate Dashboard software, which offers users either one-click on-demand or customizable, scheduled backups for their devices. 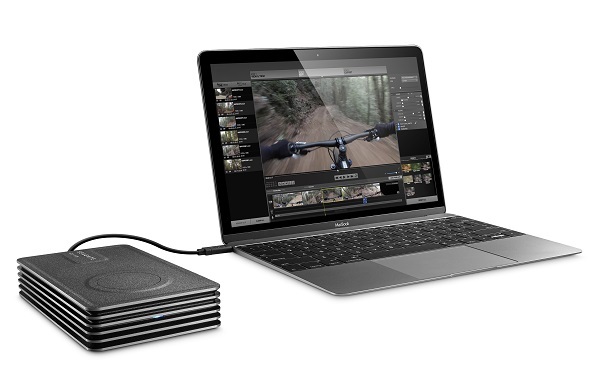 Further, Seagate Innov8 includes 200GB of Microsoft OneDrive cloud storage and Lyve software compatibility, so users can back up, access and share their favorite files from any device or location. Seagate Innov8 will be available in April for $349 (US MSRP) through Seagate.com, Amazon and other premium resellers.